Last week, our family returned from our big trip to the Disneyland Resort in California. While planning our trip, I reached out to as many Disney gurus as I could to ensure we hit all the highlights during our long weekend visit. Unanimously, everyone suggested we see World of Color, the nighttime spectacular at Disney’s California Adventure. The best way to see it, they suggested, was by booking a dinner package. The World of Color dining packages allow you to book reservations at Ariel’s Grotto, Wine Country Trattoria or Carthay Circle Restaurant. 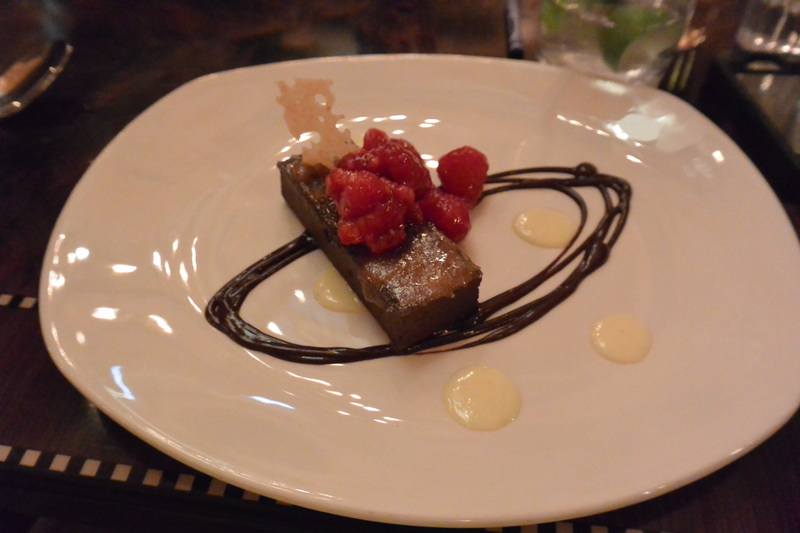 Next thing we knew, we booked a reservation at Carthay Circle Restaurant and I was so excited to give it a try. 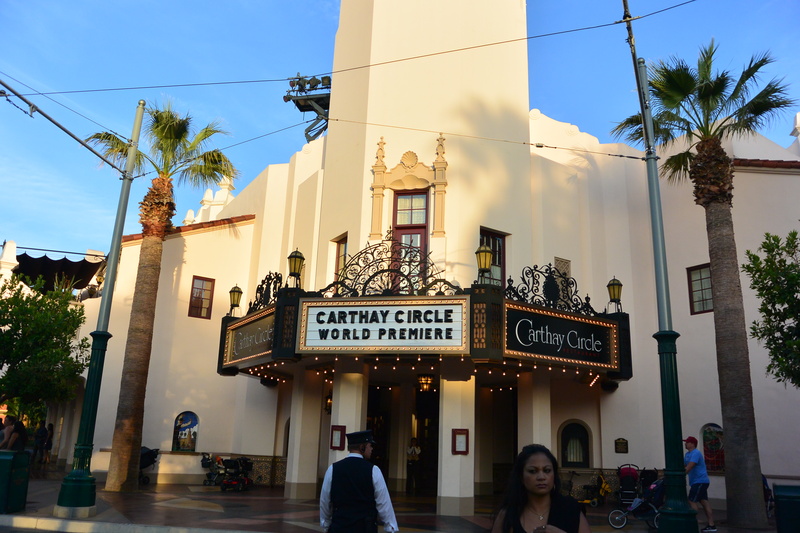 Carthay Circle sits between the new Buena Vista Street and Hollywood Land sections of Disney’s California Adventure. Outside, it feels like the golden age of Hollywood. Bright red street cars pull up front of the beautiful theater, swing-time band Five and Dime pulls up and plays live music in the square, it feels like you are transported back in time. Maisy LOVED dancing to the band, Five & Dime. And I have to admit, I got into the action too. Carthay Circle Restaurant is a detailed reproduction of the iconic Carthay Circle Theatre where Walt Disney’s first full-length feature film, Snow White and the Seven Dwarfs, premiered in 1937. Details of Snow White and the Seven Dwarfs are all over the beautiful restaurant. 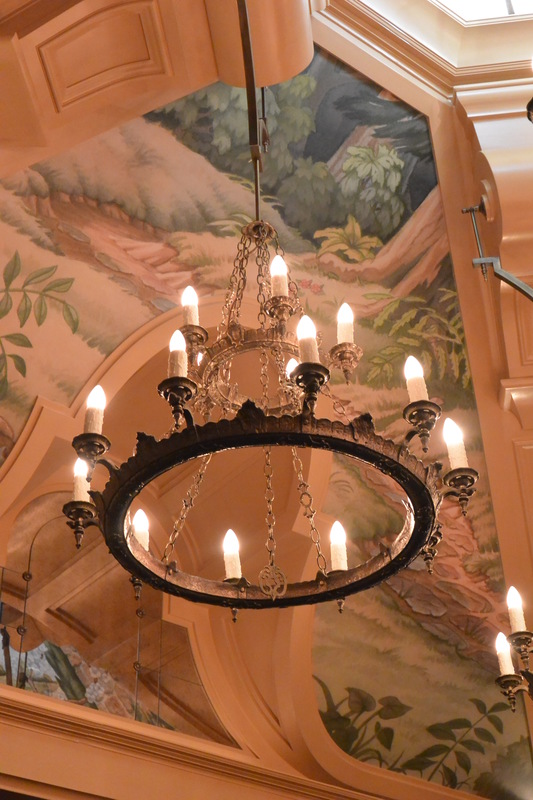 The chandeliers overhead are designed to reflect the crowns of the Evil Queen, with pastoral countryside scenes painted on the paneled ceiling. Walking inside, you feel like you are walking into the lobby of an old theater. 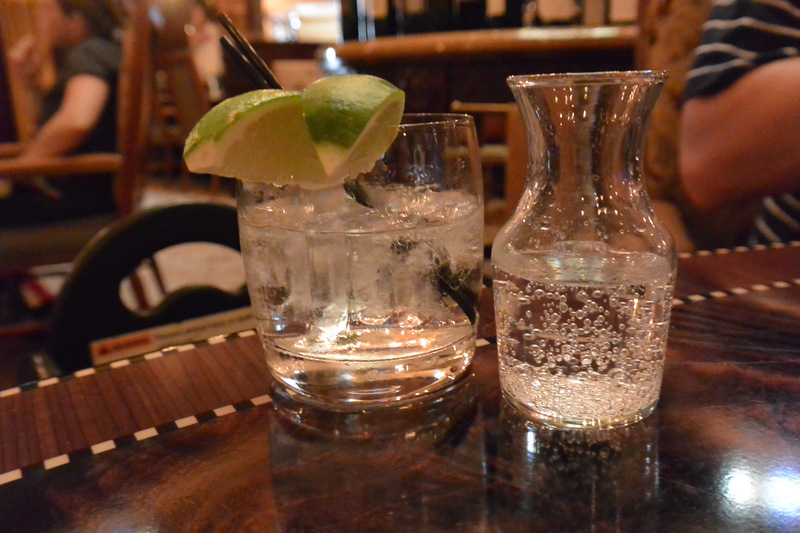 You should totally spend a little time in the lounge and order the classic Carthay Circle gin and tonic. The class on the left is all ice and gin, served with a small carafe of tonic and a lime wedge. It was the smoothest, most delicious gin and tonic I’ve ever ever had. And, it was easily the highlight of my trip! The World of Color dining package is a fixed price menu. I enjoyed the fresh spring salad, and the angus steak. The best part of the meal was the amazing service. The restaurant was very nice and I knew Maisy was a bit cranky so I worried we would be rushed so our child wouldn’t disturb those around us. Instead, we had a waitress who was so accommodating, bringing Maisy extra crayons, talking to her about the movie she was watching on the iPad, even warming up my food again when I didn’t touch it right away as I was dealing with feeding the baby. Everything you would expect of a Disney Guest Service experience and more—she made it truly special. At the end of the meal, we were presented with our World of Color tickets and told we could enter the area as early as 9 p.m., one hour before the start of the World of Color show. 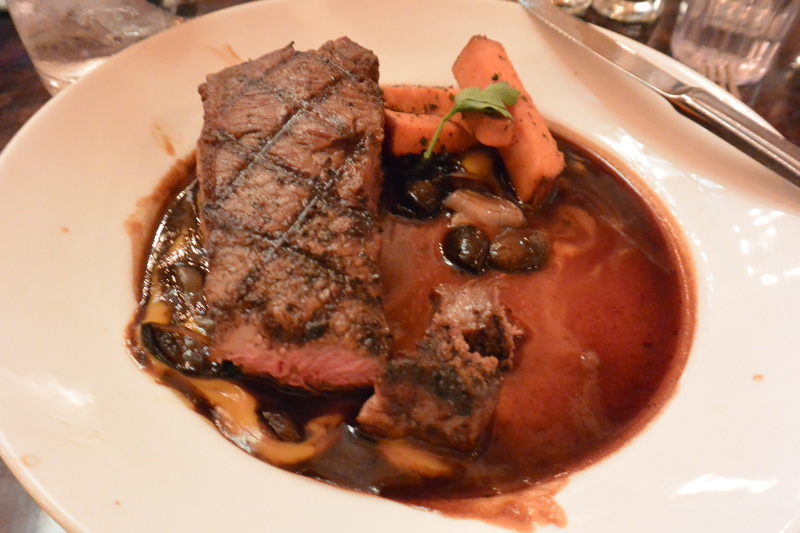 If you do the dining package, I would recommend getting to the area as soon as you are able. World of Color is a VERY popular show. We arrived to the area around 9:30, and had only mildly good seats. The show was absolutely amazing. We can’t wait to return to Carthay Circle and Disneyland again. The Cast Members, the Guests that visited, everything was amazing. I would go back in a heartbeat. 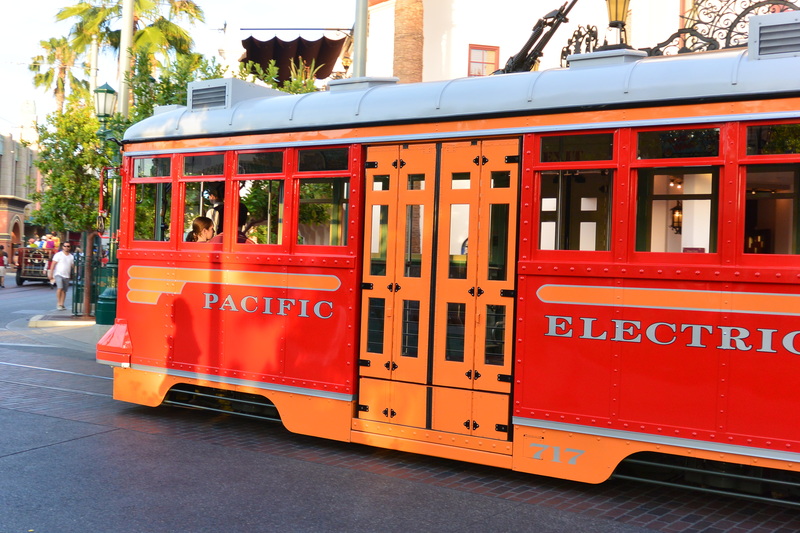 Have a favorite place in Disneyland or Disney’s California Adventure? Let me know in the comments!